Heading "South" – Any Ideas? For various reasons we haven’t taken a vacation (of more than a long weekend) in several years. When looking at the calendar late last summer, it looked like the best time, schedule-wise, wouldn’t be until the end of January / beginning of February – so that’s what I locked-in on the vacation calendar at work. Now we’re ~3 weeks before the vacation and all we’ve really decided is that we want to drive (for a bunch of reasons) and we want to head “south” (for obvious reasons). Of course it would be this week that Florida is under “freeze warnings”, but that’ll be over soon (might be in the 50s by Monday here even). So I’m looking for input, and I need it fast, for what to do “south of Michigan” and what to do on the drive down. This’ll be our fourth road trip as a family in the big van. 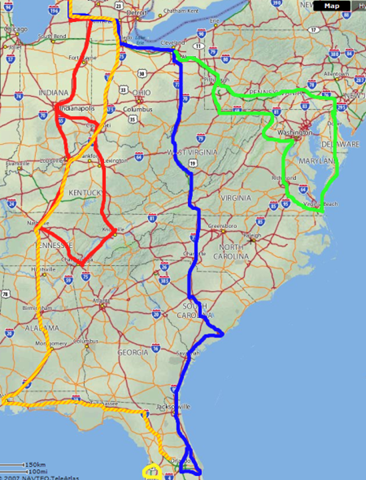 First we went south-southeast and spent some time in Indianapolis, Nashville and Chattanooga (red on the map). Next we went to Florida via Charleston, Hilton Head, Jacksonville, St. Augustine, to Orlando (Disney / Sea World) (blue on the map). Then we went to Williamsburg/Jamestown/Yorktown, Virginia Beach, Chincoteague/Asateague, Lancaster, Gettysburg, etc. My gut feeling this time was to head “straight down” to wherever that hit salt water and then follow the gulf-coast down into Florida (the striped yellow line). Then we’d at least “add a state” to our list (i.e. Alabama) and see roads and sites we haven’t seen before. Half the fun of driving is taking it a little slower (6-9 hours a day) and seeing what is “in between” the scheduled stops. While we will certainly end up in Florida, I’d like to see if there are things in Kentucky, Tennessee, and now Alabama that we haven’t seen before (what is in Alabama? Birmingham?, Montgomery?, Mobile?, Huntsville?). So if you’ve been to Kentucky, Tennessee, Alabama (especially with say 30 minutes of the yellow line) and have something interesting to recommend, I’d be really interested in hearing about it. Also Florida pan-handle gulf-coast ideas would be great too. Once in Florida we can do Clearwater, Tampa, Orlando and on over to the ocean. The current Space Shuttle launch has been delayed quite a bit, and may actually be taking off during this time period. It would really be a dream-come-true to see it launch when we are down there. We’ve done Disney and Sea World before but any other Orlando-related “must-sees” would be helpful as well. Any ideas would be appreciated – I may blog from the road if I use one of your ideas!! I know I want to still do Niagra Falls, Toronto, New England (Maine? ), New York to the East, and Chicago, Milwaukee, Minneapolis/St. Paul (up to Fargo?) to the West but this isn’t the time of year for either of those. I also want to spend some significant time in Washington D.C. sometime (but again a warmer season would be best). A Memphis/Little Rock/Jackson/New Orleans trip would be awesome too, but I think this time we are trying to get as warm as possible.